With the Bermuda grass starting to green up on top more and more, it is vital we protect them from a late spring freeze or hard frost. This means if the forecast is trending colder for a couple days with lows at 30 degrees or below, we would need to cover the greens to protect them. This weekend’s forecast has lows of 29 and 30 degrees. Due to these low temperatures we will be covering the greens on Saturday, March 30 – Tuesday, April 2 to protect the Bermuda grass and help prevent any injury that could occur. The course will reopen for play at regular time on Wednesday, April 3. This is much different than a winter covering. The plants are starting to break dormancy and more live tissue is coming up on top, versus in winter when you have a layer of dormant turf that provides some protection from a heavy frost. With growing leaf blades on top, a freeze can do significant damage. When the temperatures are freezing and below, the cells inside the leaf blade could freeze and rupture causing a big delay in complete green up and significant damage to the plant. With the plants still being young, we want to do anything and everything to protect them and assure a great playing surface for the summer. I thank everybody for their patience and hope this helps with understanding why we do some of the things we do at different times of the year. The Board of Directors would like to recognize the efforts of the Golf Task Force. In evaluating the recommendations, the Board agrees with the recommendations put forth by the Task Force. Berksdale South – The 9-holes of Berksdale that are currently closed should remain closed. The Board agrees with the recommendation from the Task Force. Berksdale North – Berksdale North will remain open, unless there is a triggering event (i.e., a devastating flood). The Board agrees with the recommendation from the Task Force. Kingswood – Kingswood will remain open, unless there is a triggering event (see below). The Board agrees with the recommendation from the Task Force. If rounds go up to 165,000 per year, the POA should begin investing funds to mitigate flood issues and bring the course up to the same standards as the other four courses. The Board agrees with the recommendation from the Task Force. If rounds decrease to below 120,000 per year, the Board may consider closing this course. Management is tasked with taking all reasonable measures to increase rounds. The Board agrees with the recommendation from the Task Force. Future major flood damage could result in a re-evaluation of the golf course. The Board agrees with the recommendation from the Task Force. Country Club – The POA should target funding for flood mitigation to the Country Club as quickly as possible. The Board agrees with the recommendation from the Task Force. ARKMO – The POA will not pursue a golf course at ARKMO at this time. The Board agrees with the recommendation from the Task Force. The Board of Directors would like to thank the Golf Task Force for their efforts. I make a motion to approve the above detailed document on Board Action on Golf Task Force Recommendations. The Board of Directors would like to recognize the efforts of the Golf Task Force and the residents of our community who provided feedback on these important decisions. All Bella Vista golf courses abide by a “Pair Up Policy” in which we try to pair single golfers and twosomes to make complete groups of four. There are reasons why the foursome is best for the golf course. The first is PACE OF PLAY. Foursomes are the most common and most efficient way of getting the most players on the course when demand is high. Second, it is no fun being the only twosome on the course, having to wait to play your shots on every hole because the foursome ahead of you is naturally slower. It’s also no fun to be the foursome playing at the appropriate pace but constantly feeling the need to step aside and let twosomes play through. Of course, singles and doubles playing on a busy course cannot expect to play through. If the course is jammed, it is much better to be paired up with others. Certainly, if the course is not overly busy, letting smaller and faster groups play through is the right thing to do. If you want to go out by yourself, you can do that too. Just try to pick times when the course is not as busy. You can call the course directly and we will be more than happy to assist you with what times will be best. Our final reason for using our Pair Up Policy is to maximize our revenue per tee time. We have a finite number of tee times during our peak hours and we need to make the most out of these times. 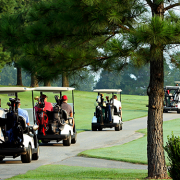 Our goal is to accommodate as many golfers in as close proximity to their desired starting time as possible. https://bellavistapoa.com/wp-content/uploads/2018/05/didyouknowheadline.png 572 1024 Natalie Short https://bellavistapoa.com/wp-content/uploads/2017/07/BVlogoh.png Natalie Short2018-07-27 11:08:042018-07-27 11:08:04Did You Know? 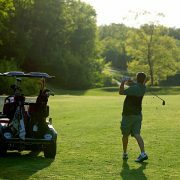 At Bella Vista Country Club you are now allowed to drive your golf cart from the clubhouse to Tanyard Creek Practice Facility to warm up before your tee time. 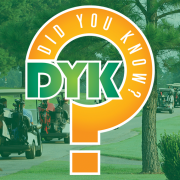 We ask all golfers to be considerate of other golfers who are already playing on holes #6 through #9 while they drive to and from Tanyard Creek. Take advantage of a good warm up session and be back 15 minutes before your allotted tee time. Play where you are comfortable! With most of Bella Vista’s golf courses having 5 tee boxes now, make sure you are playing the correct Tee box. Hitting long irons or fairway wood into par 4’s & 3’s makes for a long and frustrating round. There are many different thoughts about this topic out there today. Suggestions include making sure you are using no longer that a 7 iron in to most Par 4’s on average. However, with new equipment and clubs like hybrids, that throws that suggestion out the window. The PGA and USGA came up with this table and it goes according to your average driving distance. This chart is a guideline to help golfers tee it up from the correct tee box.